Site selection and development are important components of a building’s sustainability. The Sustainable Sites category discourages development on previously undeveloped land; seeks to minimize a building's impact on ecosystems and waterways; encourages regionally appropriate landscaping; rewards smart transportation choices; controls stormwater runoff; and promotes reduction of erosion, light pollution, heat island effect and construction-related pollution. Buildings are major users of our potable water supply. The goal of the Water Efficiency category is to encourage smarter use of water, inside and out. Water reduction is typically achieved through more efficient appliances, fixtures and fittings inside and water-conscious landscaping outside. According to the U.S. Department of Energy, buildings use 39% of the energy and 74% of the electricity produced each year in the United States. The Energy & Atmosphere category encourages a wide variety of energy-wise strategies: commissioning; energy use monitoring; efficient design and construction; efficient appliances, systems and lighting; the use of renewable and clean sources of energy, generated on-site or off-site; and other innovative measures. During both the construction and operations phases, buildings generate a lot of waste and use large quantities of materials and resources. The Materials & Resources category encourages the selection of sustainably grown, harvested, produced and transported products and materials. It promotes waste reduction as well as reuse and recycling, and it particulary rewards the reduction of waste at a product’s source. The U.S. Environmental Protection Agency estimates that Americans spend about 90% of their day indoors, where the air quality can be significantly worse than outside. The Indoor Environmental Quality category promotes strategies that improve indoor air as well as those that provide access to natural daylight and views and improve acoustics. 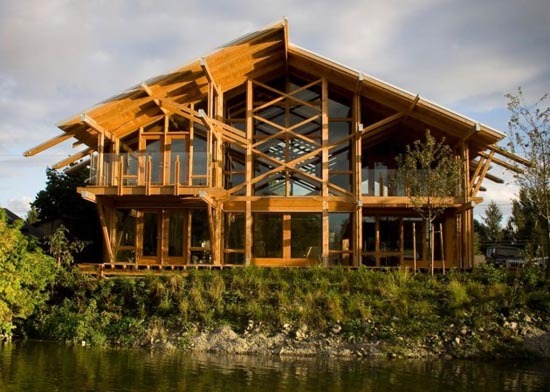 The LEED for Homes rating system recognizes that much of a home's impact on the environment comes from where it is located and how it fits into its community. The Locations & Linkages category encourages building on previously developed or infill sites and away from environmentally sensitive areas. Credits reward homes that are built near already-existing infrastructure, community resources and transit – in locations that promote access to open space for walking, physical activity and time outdoors. The LEED for Homes rating system acknowledges that a home is only truly green if the people who live in it use its green features to maximum effect. The Awareness & Education category encourages home builders and real estate professionals to provide homeowners, tenants and building managers with the education and tools they need to understand what makes their home green and how to make the most of those features. 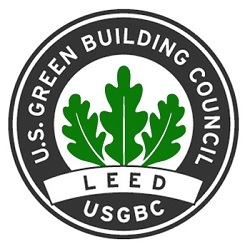 The Innovation in Design category provides bonus points for projects that use innovative technologies and strategies to improve a building’s performance well beyond what is required by other LEED credits, or to account for green building considerations that are not specifically addressed elsewhere in LEED. This category also rewards projects for including a LEED Accredited Professional on the team to ensure a holistic, integrated approach to the design and construction process. USGBC’s regional councils, chapters and affiliates have identified the most important local environmental concerns, and six LEED credits addressing these local priorities have been selected for each region of the country. A project that earns a regional priority credit will earn one bonus point in addition to any points awarded for that credit. Up to four extra points can be earned in this way.